Think about windows coated with transparent film that absorbs harmful ultraviolet sunrays and uses them to generate electricity. Consider a water filtration membrane that blocks viruses and other microorganisms from water, or an electric car battery that incorporates a coating to give it extra long life between charges. The self-assembled copolymer block film that makes it all possible is now being fabricated with intricately organized nanostructures, giving them multiple functions and flexibility on a macroscale level never before seen. 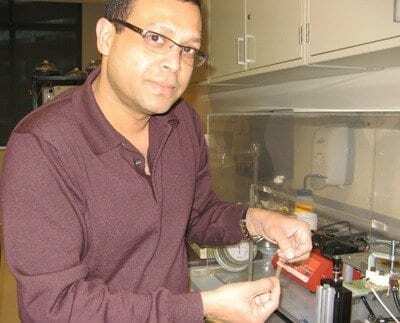 Gurpreet Singh, a Ph.D. candidate in The University of Akron College of Polymer Science and Polymer Engineering, led a team of researchers to devise a method that enables the films to assemble themselves and allows them to serve as templates or directly as end products. The films can be embedded with nanoparticles that enable everything from data storage to water purification. Superimposed with nanopatterns that allow them to be implanted with a variety of functions — electronic, thermal or chemical — the films can be produced at an industrial level, which is no small feat in the world of science, says research team member Alamgir Karim, associate dean of research for the college and Goodyear Chair Professor of Polymer Engineering. Other research collaborators include Kevin Yager of Brookhaven National Laboratory in Upton, N.Y., Brian Berry of the University of Arkansas and Ho-Cheol Kim of the IBM Research Division of Almaden Research Center in San Jose, Calif. Funded by the National Science Foundation, the research represents a market-ready revival of a technology developed by Bell Laboratories in the 1950s for metal and semiconductor purification and adapted in the 1980s for polymer crystallization. Since then, the technology remained dormant, until now.